This is one of Sidney Nolan’s more enigmatic images from Remembrances of my youth, a series which includes 14 spray-painted works on canvas. Nolan was renowned for re-mining his own images, bringing together new and previously explored ideas and forms to develop new narratives, relationships and meanings. The portraits in this series are highly individualistic, but there are conceptual and aesthetic links between these and the artist’s earlier works. This full-frontal image of a masked figure with horns and a fleeting bird is an amalgam of motifs drawn from the Ned Kelly series, as well as from Nolan’s Central Australia and Birds series. These works are all created with the spray-can. Nolan enjoyed the immediacy and directness of spray painting, a medium he learnt to use when he was young and working for an advertising company creating signs. 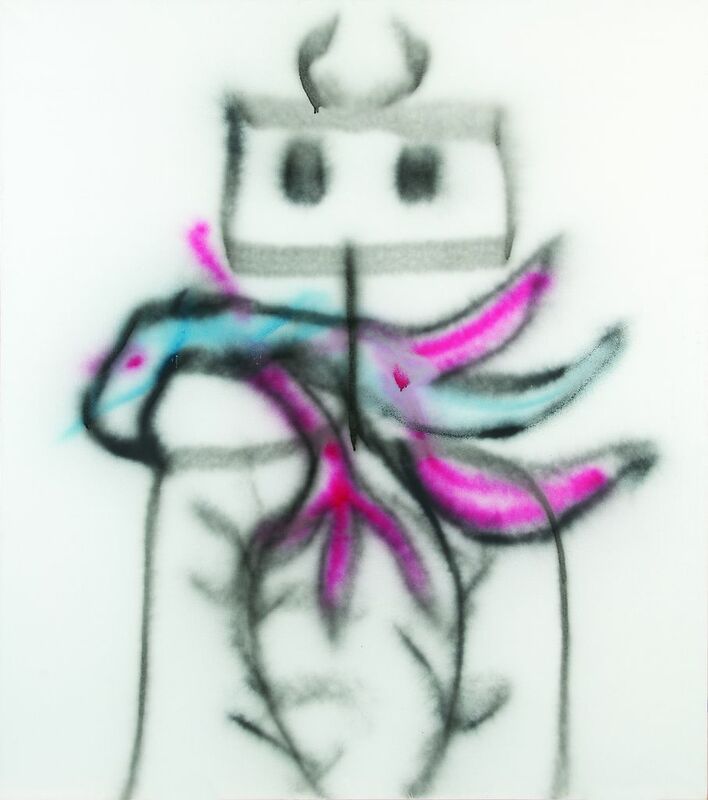 From the early 1980s he began to experiment with the possibilities of spray painting, and this is the second series he produced, after Illuminations, in which he used this technique.